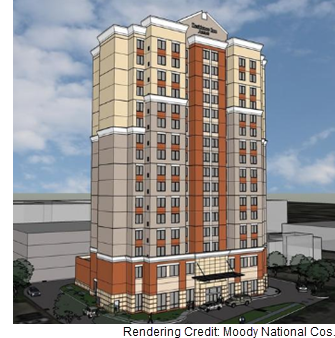 ​​​​ HOUSTON – Moody National Cos. has broken ground on its next Residence Inn by Marriott at 7807 Kirby Dr. The 16-story, 182-room hotel is expected to open in early 2019. The project will include a 4.5-story parking garage. The hotel will be less than a mile north of NRG Stadium and roughly a mile from the Texas Medical Center.